Danny (front) and Dennis (rear). Healthy and thriving in Central Park only days ago, Danny is now missing and presumed dead. Dennis alone again -- but not so naturally yesterday. Fisherman removing large carp from net yesterday at Oak Bridge. "This is a feisty one!" exclaimed the fisherman as the carp frantically flapped and struggled. It never fails to occur. At the time of year which is the most beautiful and attracts the most people to Central Park. At the time when our abandoned domestic ducks appear to be the most robust and contented. When the living appears to be the easiest and food is plentiful and when weather and temperatures are the most comfortable with few natural predators around. That is when the Grim Reaper seems to appear out of nowhere and swoop up one of our flightless, feathered friends. Danny is the apparent victim this time. Danny is one of the two domestic ducks (Dennis being the other) surviving at Central Park's boat lake for the past two and half years. And both male, Black Swedish ducks had previously lost the female domestic duck who had flocked with them throughout the previous fall and winter. All three ducks had become friendly with and flocked with Dennis, a male Khaki Campbell duck who had lost his female mate two springs before. In the more than four years Dennis has been (miraculously) eking out survival in Central Park's boat lake, he has now lost three companion ducks and flock mates. All three domestic ducks suddenly vanished one day in the spring. And all three had previously been healthy and robust, showing no signs of stress, illness or injury before suddenly disappearing into nothingness. The same, exact scenario has played out at Harlem Meer in Central Park for a number of years. Of the fourteen (abandoned) domestic ducks I have observed at the Meer over seven years, six eventually had to be rescued, one died of illness during the summer, one is still (supposedly) hanging in there and six suddenly vanished one day in the spring after displaying no signs of distress. And yet all had survived at least one winter at Harlem Meer -- in the cases of 2013 and 2014, particularly brutal winters in which more than 90% of the lake was covered in ice for most of the season. So what could account for these sudden disappearances -- especially at a time of year when the birds are otherwise doing well and life is the easiest? It also doesn't appear to be a situation of natural predation. Raccoons live around the Central Park, but represent virtually no threat to healthy ducks. Moreover, the ducks are well aware of raccoons and show no fear of them. With harsh weather, lack of food availability and predator threat virtually eliminated as causes for domestic duck losses in Central Park during the spring, that leaves only two other options: Sudden illness or nefarious human action. In all cases of sudden disappearances of domestic ducks in CP, none of the birds had shown any signs of being ill, weak, lethargic or injured up to the time they vanished. Personally speaking, I suspect fowl play (no pun intended) on the part of humans in all such disappearances. Perhaps it is no small irony that on the very day I spent searching the entire boat lake for Danny, I also encountered a fisherman using a sizable net to capture a large carp near Oak Bridge -- the very area that Dennis and Danny tended to roost in the evenings. The fisherman went to the edge of the lake to entrap the carp and then dragged the fish on to the bridge in order for his friends to snap photos. "Oh, this is a feisty one!" the fisherman exclaimed as the fish frantically thrashed and struggled on the bridge. Watching the unpleasant scene, I finally asked the young man when he was going to return the fish to the water as required by Central Park rules? "These fish can stay out of the water an hour!" the man angrily barked. "And what's it to you? Mind your own business!" I began to also take photos and it was only then that the man finally took the fish back to the water after having it out a good five to seven minutes. The fish appeared dazed when returned back to the water and took some minutes to regain composure and swim. "These fish don't belong in Central Park anyway!" the man muttered while reluctantly walking away. "They are an invasive species." Well, I guess one could say that domestic ducks "don't belong in Central Park" either and "are an invasive species" -- even though it is people who put them there in the first place. But, it seems as people abandon and put in, they also take out. While I cannot say with any certainty or proof that it was the fishermen who took Danny from the CP boat lake, they had the equipment to capture a domestic duck on the water (i.e. sizable net). 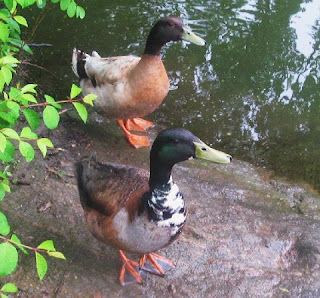 That they were in the same area where the two domestic ducks typically roosted at night, can be chalked up to "coincidence." But I felt so bad when finally leaving the boat lake and seeing Dennis so alone and grieving once again, the loss of his very special friend and constant companion.